Namco Games has released the multi-tasking puzzler game Lieutenant Fly for the iPhone and iPod touch. Lt. You match 4 blocks falling and spiders down. As you play you’ll collect more ammo which you’ll use to destroy additional spiders attacking your army. Use the special attacks to blow away those pesky arachnids. You’ll play through 20 levels going through bosses and bonus levels. The latest version of Lieutenant Fly has added an endless mode, and gives you the ability to use special weapons for boss fights. Lt. 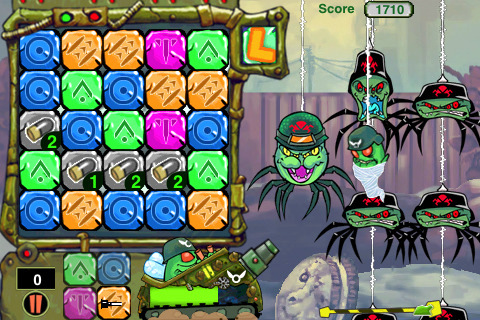 Fly features a Fly that is tasked with matching blocks on one side of the screen as ammo to use on the other side, killing spiders that drop from the sky. This game will appeal to action and puzzler fans, and tower defense gamers alike. A very neat combination idea that makes for a challenging puzzler best suited for someone looking for a tough challenge. Caution: Avoid this game if you’re looking for a relaxing time waster. Developer: Namco Networks America Inc.
AppSafari review of Lt. Fly Rise of the Arachnids was written by Joe Seifi on March 11th, 2010 and categorized under Action, App Store, Fun, Games, Puzzler, Tower Defense. Page viewed 3066 times, 1 so far today. Need help on using these apps? Please read the Help Page.